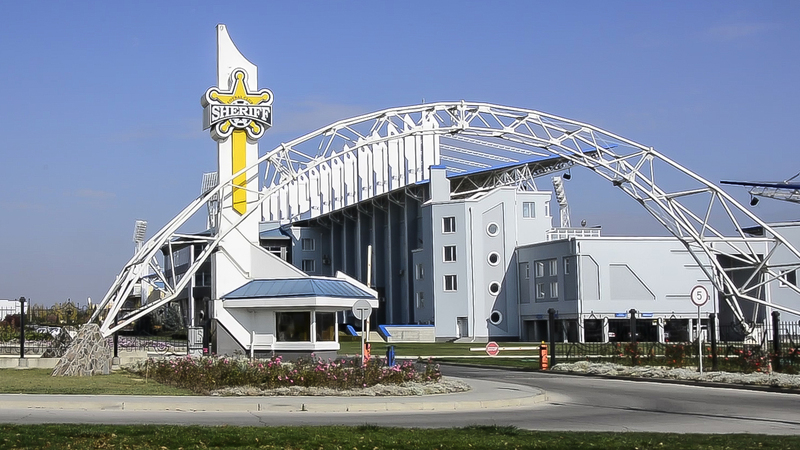 By the time we got organised and said farewells to our new friends, it was already early afternoon and we decided to say goodbye to the city itself by having a meal in a simple Moldovan diner “Strelka” using our last Moldovan money – leu (MDL). Suppose, we got a little over-excited with our order, choosing 3 courses each – we definitely got a bit over our heads, particularly because we intended to cycle straight after the meal. This resulted in not having enough of the right cash in our pockets (we were around 1€ short). 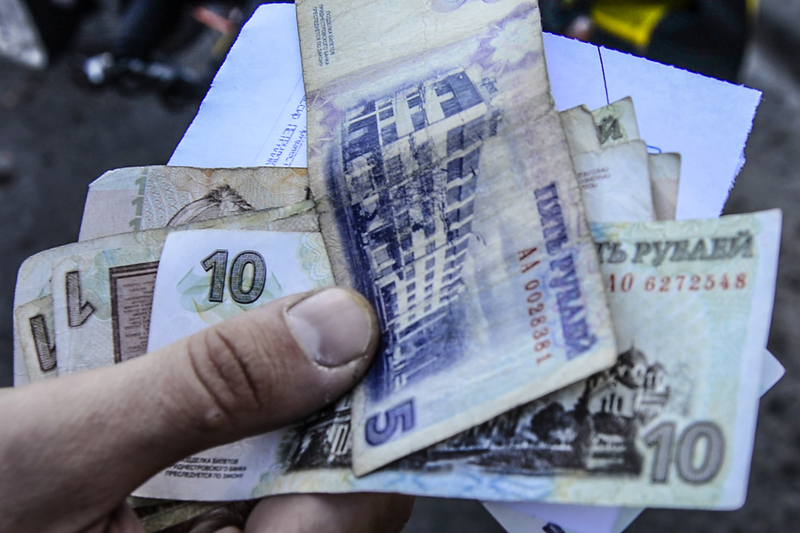 We contemplated of going to a currency exchange place to get some more money, but then again, getting more leu was something we would not need anymore, since we planned to cycle to the border of Transnistria that afternoon and back in Ukraine after that. Thankfully, the women at the counter accepted some of our Ukrainian hryvnias (UAH) instead, this proved to us once more – there are good, understanding and kind people everywhere. Finally, in an incredibly warm and sunny October afternoon, we were ready to pedal some 60 km to the Moldovan-Transnistrian border. The cycle itself was not filled with adventures of any real significance, just the surrounding road-side stalls with harvest vegetables and fruits everywhere, some interesting mosaics by the bus stops or just next to the roads and the golden autumn scenery with surrounding fields attracted some attention. We made a little stop at a small place called Tintareni, so that Ivars could go after a quick geocache a few km off the road, since the whole geocaching experience had been a little disappointing in Moldova, he was eager to tick off some more finds in this country – success. Afterwards, the condition of the roads actually started to get better, not without the considerable increase of wind and some small hills of course, up until the stage of watering eyes even through glasses. The sun had disappeared a while back but the last kilometres in the country were followed with surrounding vineyards and fields, and we soon found ourselves pedalling and bouncing off-road in a colourful forest to spend the night right by the border. Our previous experience in Transnistria, as amusing and ridiculous as it was, had taught us that if we plan to visit it for touristic or any reason, we had 24 hours before the need to register with the local authorities. This is the reason we’d decided to stay just before the border crossing – it would simply give us more time in the area after entering it. However, the next morning, filling out the migration cards, under “the purpose of visit”, we did not check “tourism” but “transit”, as it was advised to us previously, unfortunately this gave us only 10 hrs in the whole region, shortening our visit more than two times. What’s done is done – this time when we entered the unrecognized country of Transnistria (a.k.a. Trans-Dniestr) our senses were sharp in order to see for ourselves the “strict regime” and the Soviet heritage of the area – described by people also as “the Black Hole of Europe” and “the open-air museum of Soviet Union”. First things first, right after we got the little, stamped Pridnestrovian Moldavian Republic (Приднестрóвская Молдáвская Респýблика) migration cards, we found ourselves riding downhill in the city of Bendery (Бендеры), the buffer zone between Moldova and the unrecognized Transnistria. We set out to the Bendery Railway museum since it was not far off our favoured route, even if we did have limited time in the area, and quickly found a geocache there. 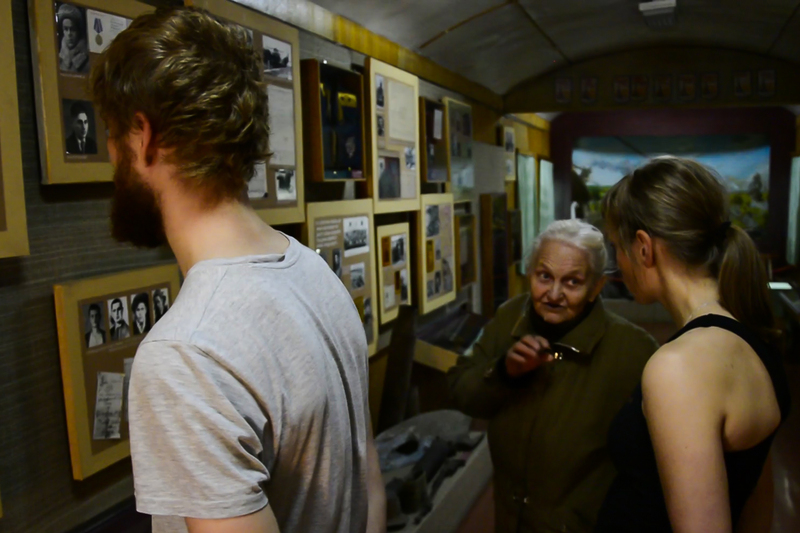 Then, we got an extensive introduction in the railway system and history by the two incredibly lovely, old ladies – babushkas (бабушки) responsible for the tours in the old train carriages. Much in detail, even our repeated remarks on the shortage of time we had at our hands could not stop them, how passionate they were about the subject. It only made them speak faster and faster, this might not have been a problem to the boys, unfortunately, my Russian skills are more limited, and since then, most of the information has been long lost in the back of my head. But what’s remained is the memory of welcoming people and beautiful images of history. Another mystery we solved was the post office and its system. Since Transnistria considers itself an independent state, they have their own postmarks too. From what we knew previously, it is considered problematic to send anything abroad from Transnistria. However, after consulting with the employees of the post, we found it easy enough to purchase Moldovan marks and stick them on our postcards, since the post is sent through Chisinau anyway. Here I have to add that the stamps are bought with PRB, not MDL as stated on them. Feeling satisfied enough with the answer at first, we were a bit thrown aback by a new fact a moment later – if we would want to add Transnistrian postmarks as extras, just in a souvenir-like manner, our mail would never reach its destination. It’s, however, just another peculiarity of this self-proclaimed state. Cycling along the main streets of Tiraspol we found ourselves in an environment somewhat reminding us of Belarus we visited not that long ago and parts of many post USSR countries – with wide main streets and undeniable hits of Soviet; Socialist and Brutalist architecture. This did not, however, feel like an open-air museum. Maybe it is because we come from a post-Soviet state ourselves and can recognize the similarities with some districts back in Riga, or, quite possibly, we simply did not spend enough time in Transnistria to be able to judge it. Of course, we were greeted by a monument of Lenin as soon as we approached the central part of the city. We were a little surprised when we met some men there, who were quite intrigued by our Latvian flag and wanted to take pictures with our flag on their tank monument (not being sure if this would be a wise idea after the adventures in Belarus, we eventually gave in) and a little astonished to see possibly the coolest looking little kid sitting on top of the tank. 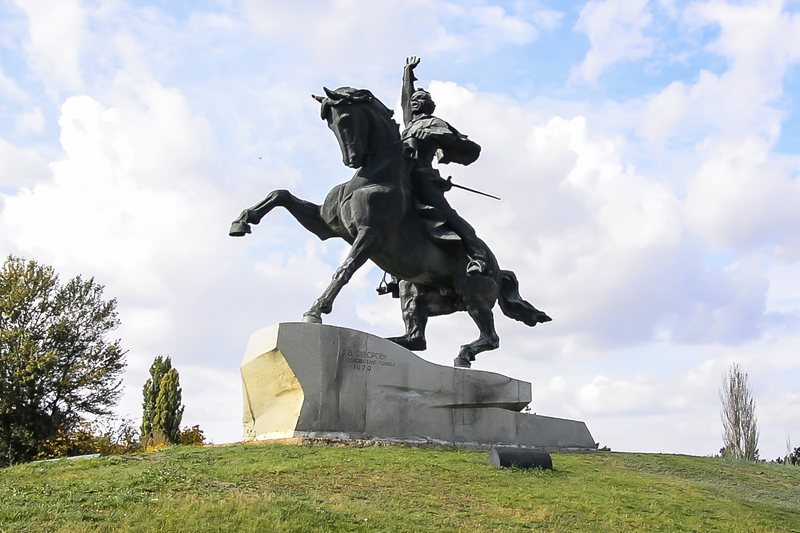 But the most attention and honour in Tiraspol is left to Alexander Vasilyevich Suvorov (Алекса́ндр Васи́льевич Суво́ров), the man considered to be the founder of modern Tiraspol, even if the area was inhabited thousands of years before his arrival. After some more cruising through the city, we bought our lunch in one of the many “Sheriff” stores, since we had to know what it’s all about, and decided to have it in the nearby Victory Park. We were approached by two local men, very interested in our story. We were invited to stay in Tiraspol as their guests, a warm invitation we had to refuse, simply because our migration permit would not allow it, instead, we chatted, sitting on the park benches and found out about their political, social and economic views and situations I would not want to bore everyone with here. We left Tiraspol in the afternoon and faced a pretty dull road, a straight line to the border of Ukraine, I must admit though, the roads in this part of Trans-Dniestr are far more better than the roads we experienced before in Ukraine and Moldova. We spent the last moments of dusk at the border point, reflecting on the experienced in an awkward video and watching the countless dubossari (if you want to know more about them, read Ivar’s previous entry). Contrary to the information we’d gathered before, there were no signs of resentment when we took out our cameras to take pictures and film some footage; even though some military troops were present at some parts, the “strict regime” was not intruding our free spirits; and the people – well they were most kind and welcoming. I must only add that it would not be the wisest of ideas to film the border check points, but then again, it is not really allowed in a lot of countries around the world. We crossed the Transnistrian-Ukrainian border in dusk and as soon as we were back in Ukraine we found ourselves on a bumpy, old and narrow road at pitch-black night. Deciding it would be smarter just to camp as soon as a reasonable place was spotted, we took one of the first side roads and stopped a couple of hundred metres off the main road, in a field. Since it was dark, we were a little surprised to hear nuts cracking under our soles, we hadn’t noticed we’d just stopped next to some walnut trees. It had been a wonderful, warm day so we decided not to put up a tent that night, only to get our plans and hopes to sleep under the starry night crushed around an hour later, when it started to rain. We woke up the next morning and it seemed the weather had changed 180°, compared to the previous day – it was cold, cold, cold and terribly windy. We just quickly packed our stuff and set to Odessa mere 65 km away. Since we had run out of petrol in the middle of cooking our meal last night already, we had some breakfast/lunch a little later that day – hiding from the strong wind behind a roadside monument. We arrived in Odessa not long after that and put a mark on our first geocache in the city. We were now on our way to meet our new host – a man, definitely one of the biggest characters, the most notorious we have met in this trip.